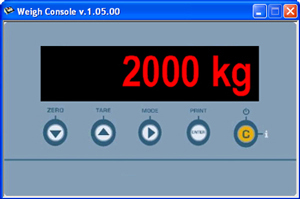 The Weigh Console is fitted with an interface which allows you to clearly and quickly view the weight which is on the connected scale and to store the weight string in any active Windows application. Furthermore it allows the reading of the stored weights, on the scales which have the integrated memory for the list of weighs (ex. DFWPM). Communication through the COM port (serial or USB, also with 485 address) or through TCP/IP address. Start of the “extended” or iconised program. "On-line" visualisation of the weight on the connected scale. Zero and Tare functions on the connected scale. 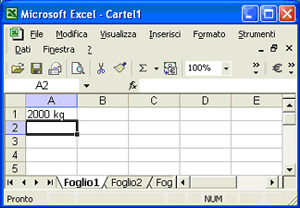 - the format of the entered data by pressing a key can be customized as one needs. 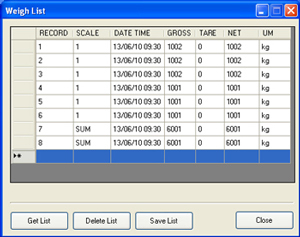 "Weighs list" function: it allows you to read the stored weighs on the scales which have the integrated memory for recording the weighs, with the possibility to save them in "Excel" or *.csv format. Reading the list of weighs from "Weigh Console" software with the possibility to save in "Excel" or *.csv format.